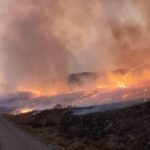 The lightning-sparked Britania Mountain fire took advantage of hot dry weather to burn within 6 miles of Wheatland. 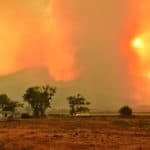 As of Thursday it was 33 percent contained. 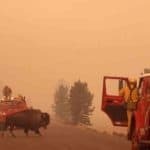 Wildfires across the West have filled Wyoming skies with smoky haze this week, but nothing yet on the order of 29 years ago, when Yellowstone National Park was ablaze. 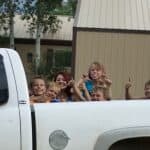 If these little evacuees regretted the Keystone Fire’s intrusion on their Fourth-of-July holiday, they did not show it in this photo. 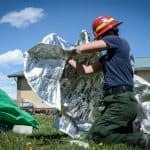 When options run out and flames close in, a thin tarp of high-tech fabric can be the barrier between life and death for wildland firefighters. Longtime Wyoming shooter Dewey Vanderhoff captured this image of a glowing orange sky, courtesy of smoke from the Whit fire and a setting sun, about 15 miles west of Cody.